We woke at 4:30 to get to our 7 am flight on Easy Jet. The early time doesn’t really matter to me since I never seem to adjust to the European clock. They fly A300’s but proceeded to tell me my flight attendant travel pro roller board suitcase wouldn’t fit in the overhead bin, and I had to pay $50 Euros to check it…what a scam! Anyway, we made it to Nice and took a taxi to our hotel, Beaux Rivage, which was lovely. We arrived very early and they tried very hard to accommodate us. The lady at the front desk was superb. Our TV in our room didn’t work, so we couldn’t check in eventhough we said we won’t be watching it! As a result, we simply checked our bags, and wandered over to the flower market area to find a place to eat. The flower market wasn’t selling flowers today, but was more like a flea market selling all types of antiques and collectibles, and it was surrounded by cafes. We selected the first café we saw on the corner because we were starving! I snacked on yogurt and bread while Theresa opted for a chicken sandwich. After finishing our brunch, we strolled back to the hotel, checked in, and found an awesome room…modern and large with a spacious bathroom and mini bar. We were pleasantly surprised. We had planned to get the lay of the land in Nice today, and therefore, did a lot of walking…much more than anticipated! 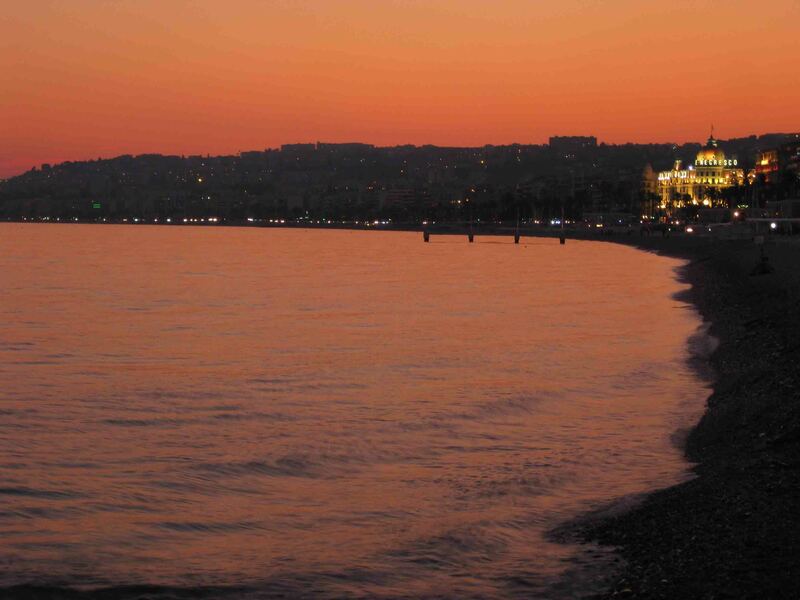 Nice is actually bigger than it appears on the tourist map. We chose our hotel because we felt it was centrally located…across the street from the beach, a few blocks from the flower markets, and not too far from Castle Hill and Port Lympia. We found newer areas of Nice with all the posh stores like Cartier and Louis Vuitton and we even watched a foot chase of someone who stole a handbag. We strolled through an older, more local area, and eventually ended up at the the “flower” market where Theresa found a brooch before we settled on pizza for a late afternoon snack. We took to our feet again, ventured into a mall and a grocery store and scored Smurf gummies for Tamara. That was her favorite thing during her semester in France, and I must admit we bought some for ourselves. They were pretty good! We continued on to the boardwalk and strolled along the beach up to the point where we watched the sunset. We planned to climb the stairs to Castle Hill, but it was closed for the evening, so we decided to round the bend. Here we found an old war memorial which was really cool and the port full of some fantastic boats. In our attempt to weave our way back to the hotel, we stumbled upon a very old part of Nice that we just loved. The streets were cobbled and almost as narrow as alley ways. They zig-zagged in every direction and connected into squares, some with fountains. Cafes with outside tables peppered the area and stayed open late night. We stopped at one called L’ecurie for wine and dessert. The menu looked amazing…I could have returned for dinner there, especially because I liked there horse sign. We swore we’d come back during the day to check out the shops that were closed for the night. As much as I liked our hotel and the proximity to the beach, I could have liked a hotel in this area. It was just great!! Not to mention, the beach was rocky and to use a beach chair and umbrella cost 30 Euro or so…not sure we will even be doing that, since we wouldn’t be spending a whole day lounging…there’s just too much to see! As we continued to wander back to the hotel, partly lost, we passed by churches, art museums and more.